How do the United States, France, Nigeria, and Chile deal with the problem of judicial review? Which countries guarantee their citizens equality under the law? Which states may suspend civil liberties in times of crisis? This informative reference work allows easy comparison between the constitutions of the countries of the world. Written by specialists in the respective country, the entries follow a common structure that makes the systems easily comparable. Following a brief preface, the introduction explores the concepts of constitutional law and fundamental rights. In the A-to-Z section, each signed country entry begins with an "At-a-Glance" box that summarizes the governmental system, the legislative system, the date of the original constitution, the date the constitution was last changed, and more. This volume also includes a narrative discussion for each entry that analyzes the constitution’s basic principles, including constitutional history, governmental regulation of the economy, and the rights and duties of citizenship. 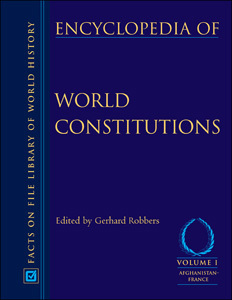 Other features include suggestions for further reading, including sources for the text of the constitution in English and in the original language; appendixes that cover the constitution of the European Union and provide an overview of special and disputed territories; a glossary; and a comprehensive index. "This work is well organized and well written and will be very easy for even junior high students to use. It is highly recommended for all libraries." "...a useful reference source, essential for academic and large public libraries and any collection stressing international politics." "With its ease-of-use, its thorough and unbiased coverage, [this encyclopedia] represents a wonderful addition to comparative government reference sources for high school students. Highly Recommended."